Certain swimming lures become the most popular in the surf every so many years. You could think that fishing any swimmer besides the popular is useless. But have you seen the JoeBaggs Swarter? 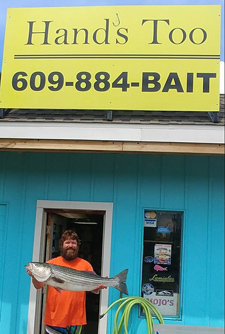 “When I first saw it last winter, I knew right away it would be perfect,” said Nick Dutton, owner of Hands Too Bait & Tackle in Cape May. He knew that the Swarter would catch striped bass that he and friends target from the surf along the shallow flats of Delaware Bay in town. That’s because the lure has no bill, helping to cast the plug far, has ball bearings that add weight and transfer that weight during the cast to help throw it the distance, and is shallow-swimming. He beached his year’s first striper, which was a throwback, and his first keeper, a 42-inch 20-pounder, on a Swarter. Click the link and see a few photos of the keeper. That’s also the keeper and Nick in the photo below on this page. Nick can work the lure 1 to 2 feet below the water surface, unlike other swimmers – popular ones – that dredge bottom along those shallows. Swarters are meant to dive 6 to 24 inches. Right now, big striped bass keep being weighed at Hands. See photos on Hands’ Facebook page. The Swarter is catching many. The stripers are apparently fish that spawned in Delaware River and are migrating to the ocean to trek north to spend summer in cool water. When you write fishing reports for a living, you notice that the river’s striper catches drop off when breeding-aged stripers begin to be reported from Cape May, and you draw a conclusion. The Swarter comes in three colors, and the company is reportedly going to introduce more. Nick fishes the Blurple at night and the yellow, named Chicken Scratch, during daytime. The Bone color is also popular, he said. The lure swims in an especially tight wiggle, sort of between a Daiwa SP Minnow and a Yo-Zuri Mag Darter, Nick said. Others are also saying that about the action. When Nick was interviewed for this article today, he had just weighed-in a striper that pounced on a JoeBaggs Freedom Fish, a soft-plastic lure. 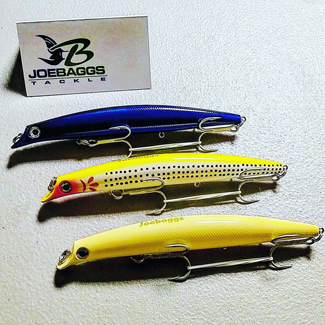 So you might want to check out other lures from JoeBaggs in addition to the Swarter. See more about the Swarter on the JoeBaggs website. Swarters are stocked at Hands, and Nick told people on Facebook to grab them when the plugs come in, because they won’t last.